Why choose the Janome DKS100? The first thing that will get your attention is the style of this machine, it is simply beautiful. The high gloss fascia perfectly complements the ceramic feel buttons. The DKS range is in its infancy but it has been an evolution from the highest pedigree. 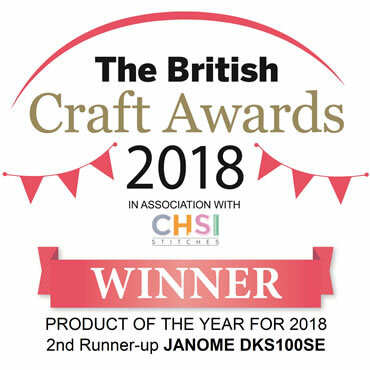 Janome computerised sewing machines have dominated the market for over 20 years and have built a solid reputation for reliability. Well now they are even easier to use this machine makes sewing a breeze. DKS (Direct Key Selection) ensures that all 100 stitches are no more than a few buttons away, with 14 of the most commonly used utility stitches one click away. The brightly LCD display makes the screen contrast easily display the exact stitch you have chosen it will also automatically preset the stitch length and width for optimal stitch performance. However you can still adjust the length and width for you own preference and or desired effect. The Janome DKS-100 has a top loading jam proof bobbin system, easy for quick set up and even better... low maintenance. Hard Cover. Plus most importantly it has Janome build quality, so you can be sure it will stitch precisely for years and years. How would you rate this Janome DKS100 SE Sewing Machine?